Oops! I grokked when I shoulda grepped! Caught being stupid! Aargh! Don'tcha just hate that when it happens? Thank goodness one of the listeners emailed me (Thanks, Duane!) so I can at least own up to it here! But in my own defense, this interview was just the day after my daughter Alyssa gave birth to a beautiful baby girl - Julia Marie. Mom, baby, and new dad John are all fine, healthy, and having a lovely time getting used to their new life at home. Me? 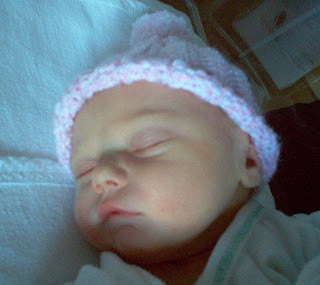 I'm just grokking that my baby girl just had a baby girl, and grepping for what it all means. DO go and read the whole story...this is important, not just from the viewpoint of the Geek Gap, but particularly to the future relationships between corporations and the Open Source community, which is many ways is the front lines between Geeks and Suits. "Jeremy Allison -- best known as one-half of Samba's leadership team with Andrew Tridgell -- has resigned from Novell in protest over the company's patent agreement with Microsoft....."
We can't remember when we first read about Buzzword Bingo, though we're sure we had the most fun reading about it in Dilbert. So, wanting to get the facts right, we did some research and found a Wall Street Journal article describing how softare entrepreneur Tom Davis had invented both the name and the game in 1993. Yes and no, according to this correspondent, who remembered knowing about the game back in the 1980s, though it was called "Turkey Bingo" then. She also remembered reading the WSJ article and thinking it was the "height of hubris" for anyone to claim credit. "Serves you right," she added, "for quoting the Wall Street Journal, the consummate suit publication, about geeks!!" Well, she certainly has a point there. We've often noted that the so-called newspapers of record, while very good on very many topics, are often behind the curve when it comes to the world of technology. We should have known better. We really do love getting corrections, we truly do. You know why? Because it means you're out there reading the book! Just to prove how much we love them, our next post will feature a whole other mistake we made. One of the things I love about living in Woodstock is the Woodstock Film Festival, which began seven years ago and has grown in size, polish and prominence ever since. Even if I made it my full time occupation during festival week to see as many movies as I want to see (I wish! ), I'd only be able to get to half of them. There are so many! Bill and I tend to focus on full-length documentaries, which are usually excellent, often teach us something, and are less likely to appear at our neighborhood theater. One that Bill insisted on seeing was A Crude Awakening: The Oil Crash, about peak oil. Is this concept new to you? Most of the world's population hasn't heard about it, but global oil production either has peaked or is about to peak--apparently it's impossible to tell till 20 years or so after the fact. Remember the oil crisis and gas pump lines of the 1970s? (If you're middle aged like us, you probably do.) Did you know it happened right after the United States reached its national oil production peak? I certainly didn't, until I saw this movie. I am, though, a big fan of the now-defunct TV series The West Wing, and I remember a pentagon insider saying sometime in the 2000 or 2001 season that the next war would be about oil, which seems prophetic, to me at least. Anyhow, the documentary, which I highly recommend, makes a powerful case for the idea that the world is running out of oil--at least, the cheap plentiful oil on which we are dependent for absolutely everything. For instance: It's winter and I love citrus, so just the other day in our little local deli, I bought a box of clementines. I checked the label, they'd come from Spain. How did they get here? Not only that, what was that little plastic netting holding them in the box actually made from? Did you know 90 percent of the products we buy contain some form of petroleum? Neither did I. The movie poses a very scary question: will our grandchildren get to fly on airplanes? Here we are, dreaming about life in outer space (and NASA just announced plans to colonize the Moon!) and it turns out today's toddlers won't even be able to fly to Ft. Lauderdale for their future Spring Break? But never mind getting drunk on the beach: we are an international family. Between the two of us we have relatives in France, Ireland, Russia, Romania and the Philippines. It's important to us to keep those connections going, so the the concept that future generations may only be able to visit by tall ship is a little distressing. Unless. Everyone I've talked to about this looming problem has come up with the same answer: Alternative energy. Solar, wind, hydrogen, hybrid cars, biofuels. Well, not really. At least not at humanity's current level of expertise. The film takes each of these alternatives one by one and points out how inadequate any of them--or all of them in combination--would be to replace the massive amounts of oil-based energy we all use every single second, never mind a few decades from now when the hugely populous nations India and China begin demanding their fair share of energy consumption. OK, say the optimisits. But we will learn to do better! Remember, even at $3 a gallon, gas is incredibly cheap--even bottled water (which comes in petroleum-based plastic bottles) is astronomically more expensive. As those prices continue to rise, the free market system will naturally fund money into alternative energy research and we will vastly improve the efficiency of our current alternative energy sources and maybe even find new ones. Have you noticed? When the optimists say "we" here, it sounds like it means "we, the human race," but what it really means is: geeks. Technologists and researchers, studying this question from all angles, with the proper funding and other resources, the rest of us feel confident, will come up with some answers that will save us all, preserve life as we know it, or at least something like as we know it. We may have to give up our Hummers, but we at least won't need a horse and buggy to get to the mall--where there won't be anything to buy anyway, with no trucks to bring it there. Techies can save us. They have it in their power. Or so we fervently hope. Next time you see a techie, you might want to give him or her a little pat of encouragement, a "You go, geek!" or some other indication that you know just how important technological research is to life as we know it, and hope to continue knowing it. That we are indeed counting on them and their kind to save our civilization.